January 16, 2018 - Equities and Inflation Climb | Inspire Financial Group, Inc. 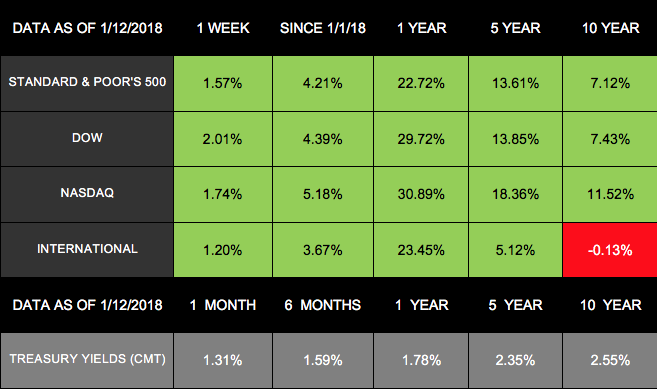 Domestic markets continued their strong start to 2018, posting gains across the board for their 2nd week. The S&P 500 added 1.57% and closed at a new record high on Friday. The index just posted its best 10-day beginning to a year since 2003, with a 4.2% gain so far this year. The Dow also hit a new record on Friday and gained 2.01% for the week. The NASDAQ increased by 1.74%, while international stocks in the MSCI EAFE joined last week's gains, adding 1.20%. By week's end, we didn't receive a tremendous amount of economic data. However, the economy did provide details that reveal it continues to pick up speed. In particular, both corporate earnings and inflation appear to be on the rise. Earnings season is upon us, and analysts expect the data will indicate strong corporate performance in the 4th quarter of 2017. Some projections show corporate earnings may have risen 11.2% between October and December last year. According to FactSet, each of the S&P 500's 11 sectors will likely record growth in both revenue and earnings. We haven't seen these kind of broad increases since 2011. In addition to gaining insight on last quarter's performance, this earnings season will provide perspectives on how large corporations expect tax reform to affect them. As we make plans for 2018, this information will help inform our strategies. On Friday, the latest Consumer Price Index (CPI) data came out, showing an unanticipated uptick in core inflation. At first glance, the inflation numbers don't seem particularly noteworthy. The CPI's December growth was 0.1%, and its annual rate was 2.1%, which met expectations. When digging a bit deeper, however, you'll see that the CPI rose at a 2.6% annual rate during the 4th quarter - significantly faster than the Fed's 2% inflation target. Even the "core" CPI numbers, which don't include the more volatile food and energy industries, have 2.5% annual growth over the past 3 months. Higher inflation may also impact stock performance. When Friday's CPI numbers first came out, stocks stumbled as some investors worried that economic growth could slow if the Fed raises rates too much. However, the strong corporate earnings data helped demonstrate our economy's vigor and reassure investors. In short, we haven't experienced such strong inflation increases in quite some time. As more details around inflation and economic growth come out, we will continue to monitor how they may affect your financial life. If you have any questions about your specific strategies and needs, we are here to talk.